Everyone who's ever tried to open a bottle of wine knows the frustration when it simply can't be done. Our newest double hinged wine waiter corkscrew is a must have and makes opening any bottle as easy as one-two-three. # Build in bottle opener --- beer or soda water bottle cap opener on the top. # Double hinged fulcrum --- double-hinged fulcrum and stainless steel worm for extra leverage and smoother pulling. Package Include: 6 x bottle opener. DOUBLE HINGED FULCRUM provides extra leverage and smoother pulling of even the longest corks. 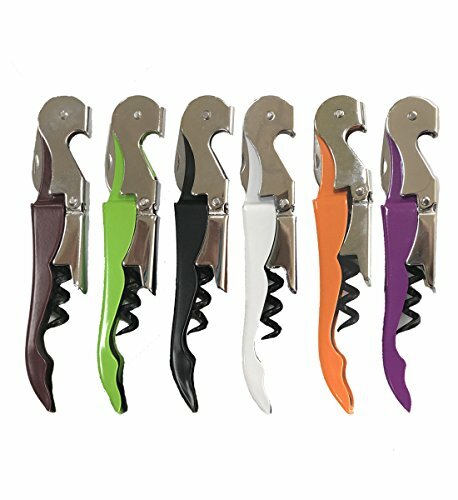 The two step hinge makes opening wine twice as easy by allowing for a nice, 2-step pull and removal of the cork. If you have any questions about this product by ZM-YOUTOO, contact us by completing and submitting the form below. If you are looking for a specif part number, please include it with your message.